Deliciously Sweet and Crunchy Pecans Fused with Caramelized Honey. Unbeknownst to most people there's a field hidden away where giant honey bees live harmoniously within a secret grove of luscious pecan trees. Over the years their delicious honey has seeped into the century-old trees, and today these majestic trees yield the world's tastiest honey-infused pecans. 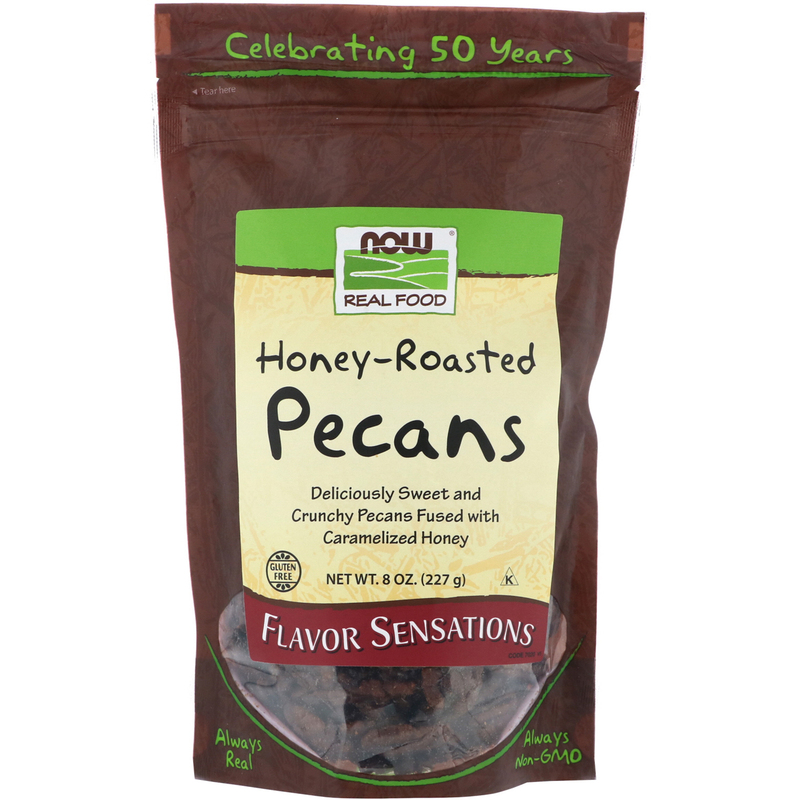 Ok, we may be embellishing a bit, but NOW Real Food Honey Roasted Pecans truly are one of nature's tastiest sensations. There's nothing quite like the sweet and caramelized flavor you get with this magnificent merger, kind of like Grandma's best pecan pie. 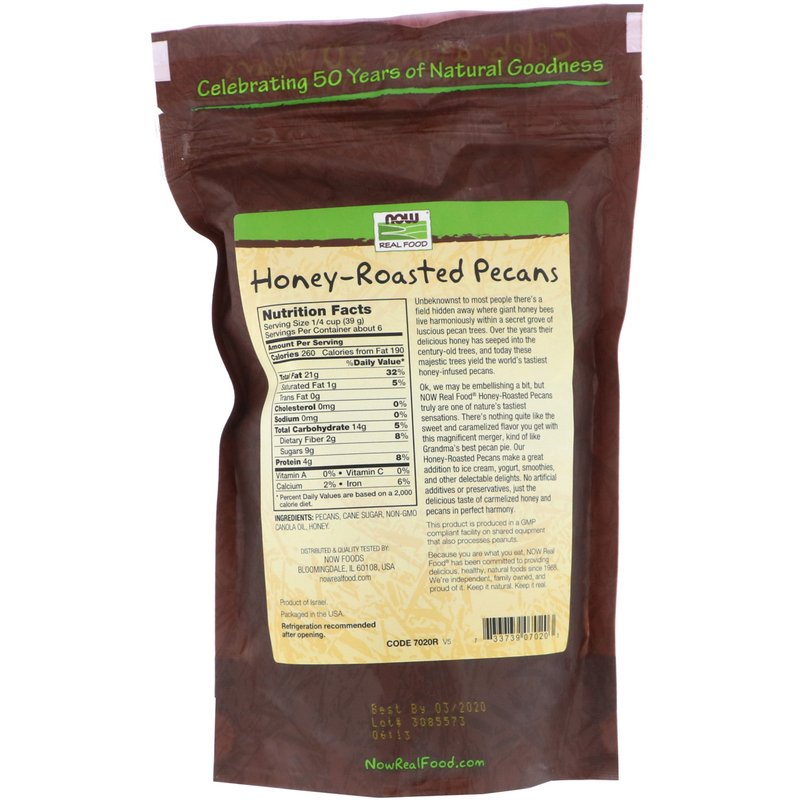 Our Honey-Roasted Pecans make a great addition to ice cream, yogurt, smoothies, and other delectable delights. No artificial additives or preservatives, just the delicious taste of caramelized honey and pecans in perfect harmony. Because you are what you eat, NOW Real Food has been committed to providing delicious, healthy, natural and organic food since 1968. We're independent, family owned, and proud of it. Keep it natural. Keep it real. Pecans, cane sugar, non-gmo canola oil and honey.